Or if they're electromagnetic trims(which they probably are), then they can simply cut power to them, turning the trim off? ^I don't think they are. Not there they aren't. There doesn't appear to be any wiring, the just look bolted into the track. 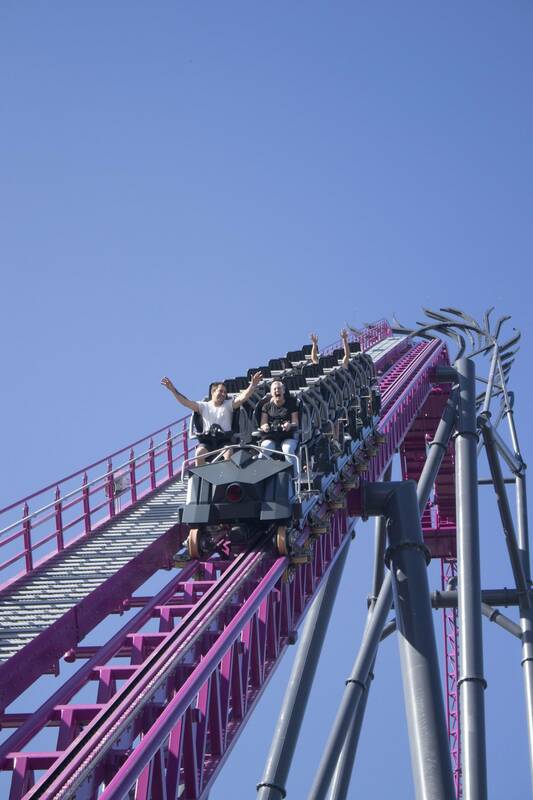 Braking systems on most modern coasters (MACKs included) are based on permanent magnets, basically like an LSM. You're thinking of LIMs, which are given a magnetic field through pulses of electricity to the metal plates (hence why LSMs can be used as brakes while LIMs cannot). For a comparison to our home park, think V2: the actual brakes are retractable b/c they're permanent magnets. Long story short, it'll be trimmed every time. Website is live for it now. It has a cool POV with live gauges showing g force and speed. Looks like it will pull -1.1 on the first hill, -1.4g on the non inverting loop. Yay! The G's don't seem particularly synched up with the actual video to me? Still, cool idea, though. just wait till you see what kind of negative Gs this thing pulls in the backwards row. The physics will be the same, but the sensation would be different. Backwards isn't the main reason, its the fact that it's the back car. Ah ok I see what you mean now, think I misunderstood a little bit! Not sure how accurate that video is though, as has been said before. Although if that first hill does pull -1 or more I'm sure it'll be amazing. The designer himself said not to worry about the trims, you'll barely feel them. They're only there to counteract the speed it gains when summer comes around. Sneaky and Hixee like this. Flashy ad, but quite catchy to me I'm still super excited for this, even though I won't be able to ride it any time soon! Some serious dodgy advertising claims in that video - kept expecting them to say *in Australia but they kept saying IN THE WORLD. Will, Tulum and Jaiden M. like this. Sneaky, GuyWithAStick, DelPiero and 4 others like this. 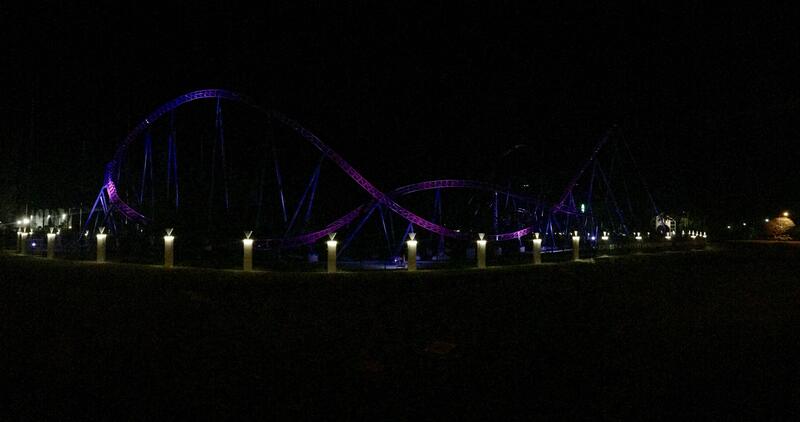 Wow, those colours look really awesome at night. This must be close to having it's first riders anytime now. Which means DC Rivals has soft opened! 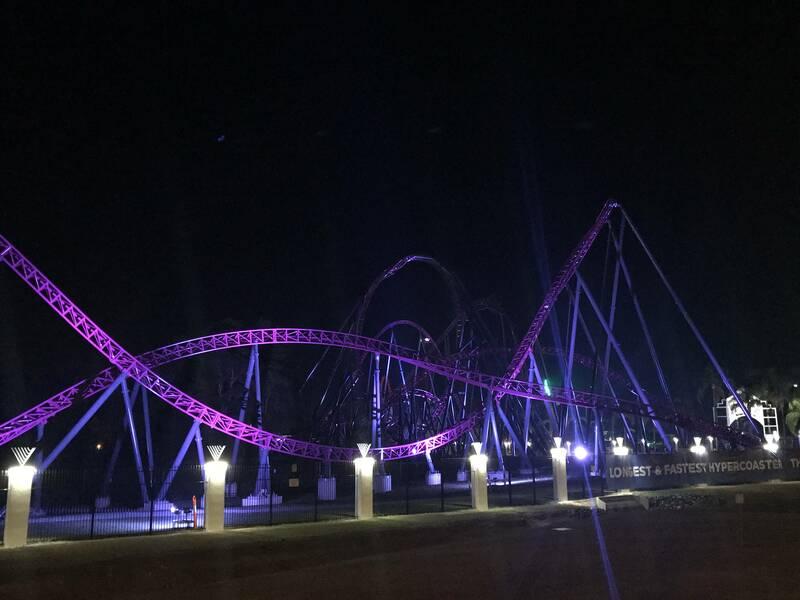 Sneaky and CrashCoaster like this. Lovely! When can we have an Onride POV? I don't think the park will do one till the construction stuff is cleaned up. It soft opened today indeed. In a word, stunning. I know you are expecting some local bias, but the ride is objectively good, and my favourite "hyper/giga". Certainly beats anything B&M have done, is more comfortable than the Intamins. For context, I have ridden all US hypers (Except Wild Thing and Mako), plus the Big One. 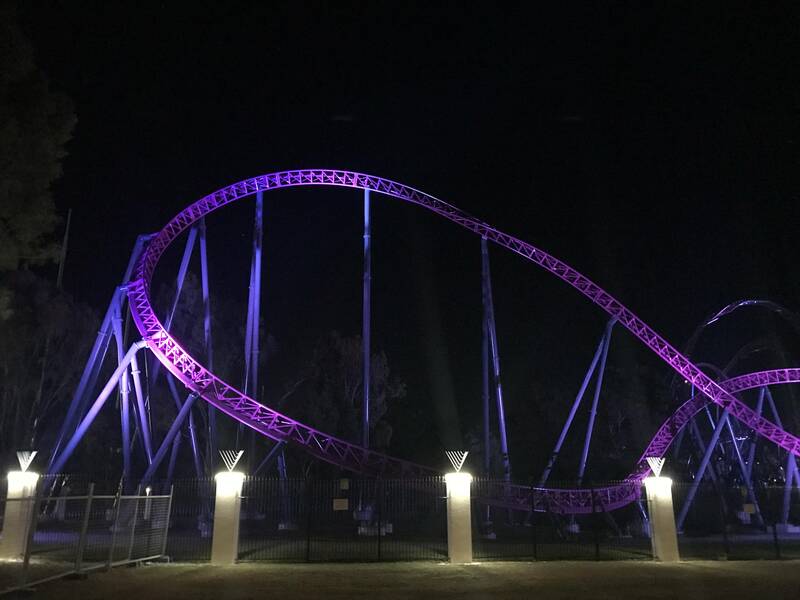 In terms of comparing wit SROS at SFNE, DC Rivals has a significantly better first drop, and better turns and variation, though I think DC Rivals could have had one extra "normal" hill...possibly in lieu of the stengel. 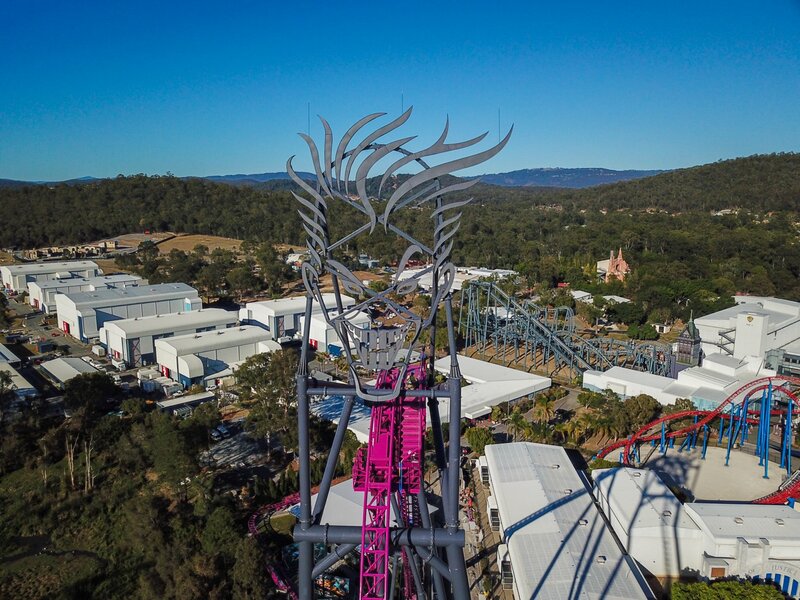 Overall, the ride has excellent pacing, very strong airtime at several points, quick transitions (So it channels a bit of I305, but doesn't have an over reliance on turns) and just a varied and interesting layout. The trains seat 22, 6 cars, but that Mack chassis design means the back car only has 2 seats that face backwards. It's a $10 upcharge to ride backwards, in timed blocks. I'll give my thoughts later on. Though its incredibly entertaining because the whole queue gets to watch the backwards riders going up the lift ting themselves. The lift hill is quite speedy for a chain...not actually that much slower than some cable lifts. First drop is nuts. On the right hand seat the rail actually goes slightly beyond vertical due to the heartlining. 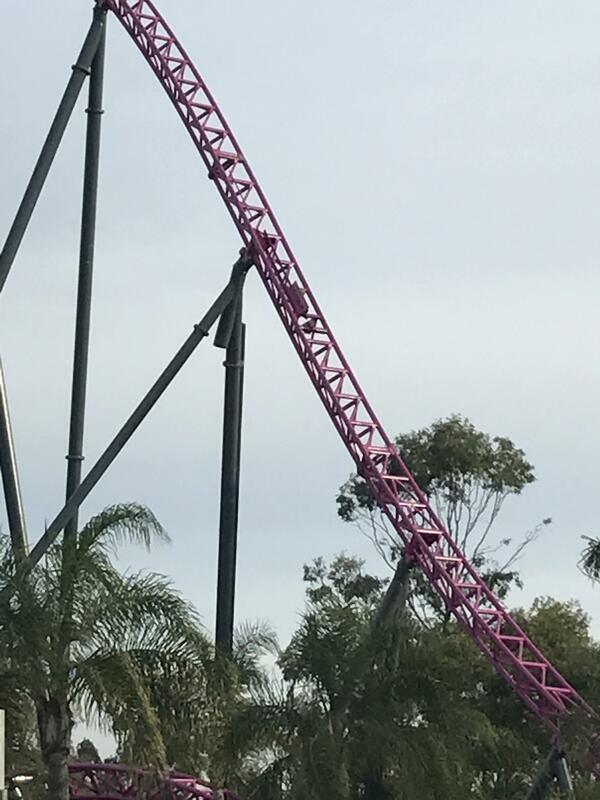 The drop feels like something RMC would do, so you are really chucked out of your seat, and dont get caught until you reach the bottom. The airtime hill, well you know what to expect, a good couple of seconds of sustained ejector and as you dive down a bit the track twists. Awesome. You get a cool effect of flying under a tangle of track as you enter the non inverting loop. Like most big loops, its not that forceful at the bottom, but then as you reach the top it suddenly changes tack and tries to chuck you out the train. A combination of ejector and intamin style "twistyness". It is like being on the outside of an inline twist, so it is that fast rotation that creates the negative gs. You drop out and into the stengel, which gets a bit of sideways floater. I suppose every hyper needs to have a tall overbank type thingy, but I would have rathered some form of hill here instead. Next up is the incline dive loop, feels like a zero g roll on entry, but again, the personality changes halfway through and you hurl around the top and out the bottom of the half loop with some pretty strong positive force. There is a low to the ground fast turn next, which is sweeping, but then transition into the next turn is very snappy, this leads around into one of those twisting S hills, so a quick pop of ejector at the top, a bit like the first hill on Rita. Following from that is the helix, which undulates up and down a bit and varies radius, so it doesn't feel like a true helix of death like the one on Titan SFOT/Goliath SFMM, but its forceful enough. The final part of the ride is a masterpiece. You bank snappily to the right, do a hard u turn, then bank snappily to the left, and then line up for the bunny hops. It positively belts through these, very agressive ejector airtime twice in a row, then a left turn and a third ejector hill over a creek, and it is sort of on a wierd bank like those ones you see on RMCs. One last quick pop as you enter the brake run, carrying a lot of speed. I think the only main negative is that it has that rattle that some people mention on helix etc. its not 'rough', and the Trackwork is very smooth so no slamming or anything like that. 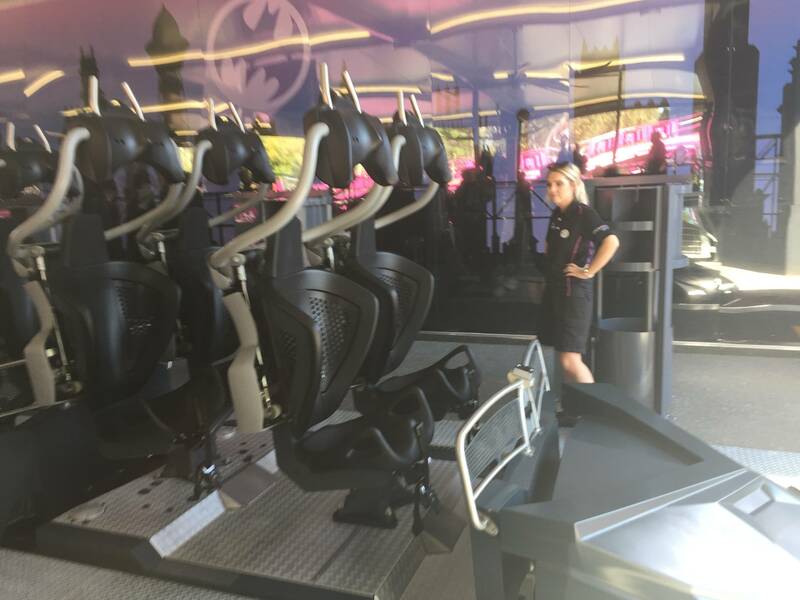 The seats are very comfortable, and have crotch seatbelts into the lap pad that unlock automatically at the end of the ride, so they don't cause delays. (I should make special mention of the seatbelts...The whole clip assembly is about the size of a smartphone, and there is a metal guide channel in the top of the lap pad, so it is not fiddly to do up and cannot be inserted upside down. As for the backwards seat, its cool because you can flop forwards going up the lift hill. It has all the crazy ejector you expect, and the first drop obviously is more unexpected. It really does trigger that primal "im falling and going to die / waking up at night feeling like you are falling" type sensation, which is pretty cool. The backwards seats do feel a tad nauseauting, nothing unbearable, and not the vile feeling you get on something like an air race, but I wouldn't call it re-ridable like any other row. I've done about 7 laps. 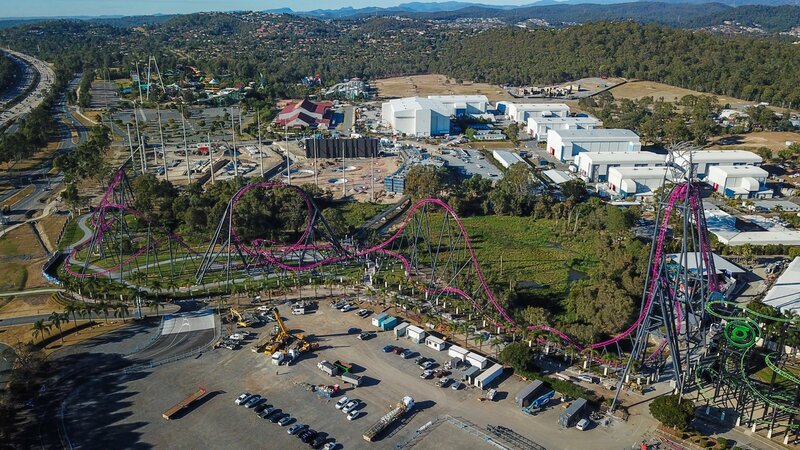 I like the back fowards row for the airtime and the crazy first drop, but the front row is good for views, and the non inverting loop feels better there. theGman, Pink Cadillac, Bert2theSpark and 11 others like this.